A TweetUp is a gathering of local Twitter users. It’s an opportunity to meet all your local virtual friends in person. Our TweetUps are fun, casual and totally relaxed. We meet at different restaurants throughout Marin. Anyone who is on Twitter is invited. If you have never come before I invite you to join us at one of the upcoming TweetUps. They’re lots of fun and a great networking opportunity. It doesn’t matter if you Tweet every 5 minutes, once a day, once a month or just opened your account we’d still love to meet you. If you are not on Twitter but are curious about it, you are welcome to stop by the TweetUp and learn more about Twitter and why we all love it so much. 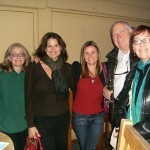 Anyone or any business can organize a TweetUp! All you do is decide you want to have one, pick a place and start inviting your friends. If you want me to tell all my friends just send me a message and I’ll probably announce it here on my blog. When you arrive to the restaurant tell the hostess you are there for the TweetUp (if it is not obvious where we are). Grab a name tag and be sure to put your Twitter ID (handle, whatever you want to call it) and your real name on it. Some of us only know you by your Twitter name. For instance the other day everybody was talking to me about this fabulous woman named Suzanna and telling me they thought I knew her. I’m thinking, I don’t know Suzanna then when they started talking more about her I said, “Oh! Are you talking about @BrainMaker from Twitter?”. LOL I knew her by her Twitter name better than her real name. Once you’ve got your name tag, order a drink if you want and then start introducing yourself to people or look for familiar Twitter names. It’s fun to meet the people behind the tweets. I hope you can join us at the upcoming TweetUps!